44" x 19" x 20"
This chief's throne epitomizes the artist's aim to load the object with metaphoric images drawn from the Chokwe culture. Brimming with small replicas of ancestral masks, the chair has great value as an instructional device. Ancestral masks (makishi) promote values associated with wealth, fertility and success in hunting. This is a grand throne, evidenced by masterful carving, a sophisticated repetition of motifs, and use of prized brass tacks. 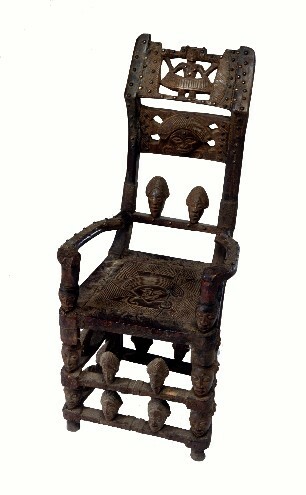 The worn, smooth and shiny areas on the arms and seat indicate that it was often used and was perhaps a favorite chair of the chief. Bibliography: Jordán, 1998, fig. 18, 21, p. 19.